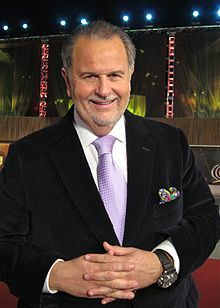 Raúl "El Gordo" De Molina (born March 29, 1959 in Cuba) is the multiple Emmy Award-winning co-host of the Univision Networks #1 rated entertainment news show El Gordo y la Flaca. Raúl De Molina was born in Cuba but left at the age of 10. For the following years he grew up in Madrid, Spain and eventually arrived in the United States at the age of 16. After graduating from the Art Institute of Fort Lauderdale, Raúl worked for the Associated Press as a freelance photographer during the 1980s. His photographs have been published in Time, Life, Newsweek, and Paris Match among others. For the past 21 years he has been anchoring television shows, first for Telemundo and now for Univision. A well-known television personality among spanish speakers in the USA, Raúl can be seen every weekday at 4pm EST as the host of Univision's "El Gordo y la Flaca", a show he has co-hosted with Lili Estefan since 1998. Estefan's and De Molina's popularity is demonstrated by the show's consistently high ratings. It has more viewers on its time slot than ABC, CBS, NBC and FOX combined. In 2008, Raúl was chosen as one of the most influential Hispanics in the United States by People en Español. In October 2008, Random House published his second book "La Dieta del Gordo" about his own struggles with weight, and his secret to losing 70 pounds. For the first time in its history, a "larger" celebrity was selected by People en Español magazine to appear in both the Most Beautiful and Best Dressed special issues. Raúl also serves as a brand ambassador for Louis Vuitton, often hosting charity receptions to benefit causes important to both him and his family, such as Voices for Children. Raúl was an inaugural contributor to the Huffington Post's Food section. He continues to write regular columns on food, healthcare, sports and Hispanic culture. He is also a regular contributor to AOL News. Raúl is an avid art collector and serves on Art Basel's host committee. His annual party is regarded as the unofficial "kick-off" event of the exhibition show. His television career, spanning 21 years, includes hosting and reporting for well-known programs such as "Primer Impacto", "Ocurrio así", "Hola América", and "Club Telemundo", as well as primetime specials and his own productions. His television performances have earned him multiple Emmy awards. Raúl is best known for his entertaining, energetic coverage of everything from the Latin Grammys in Las Vegas, to the World Cup in South Africa, to ringing in the New Year with his annual show live from Times Square. He covered the Royal Wedding, live from London in April. He was also a judge in the Miss America 2012 pageant besides Kris Jenner, Mark Ballas, and Lara Spencer. He and co-host Lili Estefan were awarded their own stars on The Las Vegas Walk of the Stars in 2009. Raúl has covered the FIFA World Cup in France, Germany, South Africa, and Brazil. Most recently, Raúl was a judge on Iron Chef America. Developing an interest in photography at the age of eleven, Raúl is an accomplished photojournalist whose work has been featured in national and international publications, among them "National Geographic Traveler", "Time", "Newsweek", "Life", "Hola", and "Paris Match." His attention to detail and rare ability to capture a story has garnered him a host of awards[examples needed] and a sell-out exhibition at The Gary Nader Gallery in Miami. Raúl continues to document all of his many travels around the globe. In 2003, Raúl published a book of all the celebrity interviews and exclusive photos he has taken of the world's best known celebrities and royals. In addition, he was a special contributor for the Spanish edition of Travel + Leisure magazine and has been featured in The New York Times Travel section. ^ 06/06/2010 5:12 am EDT (2010-04-06). "Paquita From the Hood | Raúl de Molina". Huffingtonpost.com. Retrieved 2015-04-01. ^ Smith, Stephanie (2014-12-29). "Raúl De Molina sets his sights on returning to Cuba". Page Six. Retrieved 2015-04-01. ^ McClellan, Steve (2010-10-25). "Univision on Track to Become Top U.S. Broadcast Network". Hollywood Reporter. Retrieved 2015-04-01. ^ "Raúl De Molina Takes Over!". web.archive.org. 2011-07-11. Retrieved 2019-03-14. ^ Haute Living (2010-04-27). "Raul de Molina & Louis Vuitton Host Cocktail Reception". Haute Living. Retrieved 2015-04-01. ^ 06/03/2010 6:21 pm EDT (2010-06-03). "The World's Best Restaurant | Raúl de Molina". Huffingtonpost.com. Retrieved 2015-04-01. ^ 03/18/2010 5:12 am EDT (2010-03-18). "Thanks for the Welcome | Raúl de Molina". Huffingtonpost.com. Retrieved 2015-04-01. ^ 08/12/2010 2:15 pm EDT (2010-08-12). "Alinea | Raúl de Molina". Huffingtonpost.com. Retrieved 2015-04-01. ^ a b 05/24/2010 5:12 am EDT (2010-05-24). "Health Care Experiences and Observations from around the World | Raúl de Molina". Huffingtonpost.com. Retrieved 2015-04-01. ^ "News & latest headlines from AOL". Aolnews.com. Archived from the original on 2010-06-13. Retrieved 2015-04-01. ^ Haute Living (2009-12-10). "Unofficial Art Basel Kick-Off Party". Haute Living. Retrieved 2015-04-01. ^ "Raul De Molina Pictures - The 10th Annual Latin GRAMMY Awards - Green Carpet". Zimbio. Retrieved 2015-04-01. ^ PageSix.com Staff (2010-06-23). "TV host narrowly escapes lions | Page Six". Nypost.com. Retrieved 2015-04-01. ^ "Raul de Molina Takes Over New York - Entertainment News". redOrbit. 2009-10-26. Retrieved 2015-04-01. ^ PageSix.com Staff (2011-01-05). "El Gordo rules | Page Six". Nypost.com. Retrieved 2015-04-01. ^ Ryzik, Melena (2011-02-23). "Oscar Picks, Courtesy of Univision's El Gordo". The New York Times. ^ "exposay.com". exposay.com. Archived from the original on 2015-09-24. Retrieved 2015-04-01. ^ Six, Page (2014-07-05). "Univision host snags Elvis costume for World Cup". Page Six. Retrieved 2015-04-01. ^ "Univision host snags Elvis costume for World Cup". Page 6, NY Post. Retrieved February 9, 2015. ^ "Iron Chef America Season 10 Episode 14 - Watch Full Episodes". TVGuide.com. Retrieved 2015-04-01. ^ Wulfhart, Nell McShane (2019-03-05). "What Raúl de Molina Can't Travel Without". The New York Times. ISSN 0362-4331. Retrieved 2019-03-10. This page was last edited on 23 April 2019, at 13:15 (UTC).